Who Should Be the Big Bad in the New Star Wars Trilogy? 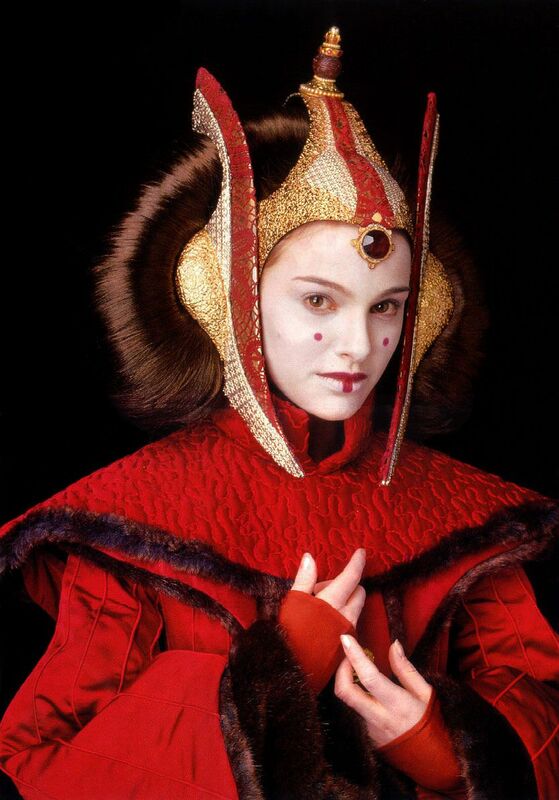 Clearly, it should be the scheming Amidala. She was the "phantom menace" from the first film, a Sith lord so subtle that she could pretend to be two people, out of a very small group of people, without either Qui Gon Jinn or Obi Wan Kenobi catching on. A Sith Lord able to take control of her world at a very young age. A Sith Lord who possesses the genius necessary to take back that world from an army of droids, using only a few grappling guns and some Gungans. Amidala, not Palpatine, decimated the Gungans by convincing them to get slaughtered for the Naboo. Amidala, not Palpatine, first recognized that Anakin was special and started grooming him for her purposes. Amidala, not Palpatine, had the most influence on the older Anakin...and literally seduced him from his Jedi vows. When Palpatine sends assassins to kill Amidala, he is attempting to dispose of a rival. In The Phantom Menace, they kept saying that there was always a bigger fish, and to be careful not to assume. In a sense, then, the prequel trilogy is actually a contest between Amidala and Palpatine, which Palpatine wins. His win causes Amidala to fake her death, and go into hiding. Yet she still hangs around Leia because, as we know, there are always two - a master and an apprentice. Moreover, Obi Wan and Yoda eventually focus on Luke because they have figured out what Amidala is, prompting her second apparent death when Leia is still young, and causing Obi Wan to dismiss her as a potential hope. Suddenly, a lot of apparent mistakes make sense. My brother's business venture: Vault 0. Costuming and accessories for gamers and fans. I have started a new blog as a home for my open Dungeon Crawl Classics game that will be starting next January. This will contain rules, characters, maps....anything that players in the game should be aware of. You can find it here. If you are in the Toronto area and feel like playing, there will be neither cost nor commitment required. Those who show up are the party that night. Either they get to a rest stop by the end of the night's gaming, or they get to roll on some tables I will be devising to determine what happens between the curtain of one gaming session and when their characters are seen next. Basically, unless otherwise arranged, one adventurous outing = one session. What will this game entail? 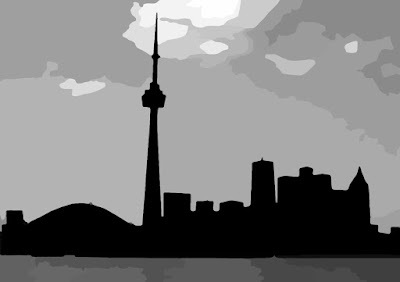 A sandbox setting (the ruins of Toronto, which effectively contains villages, dungeons, a megadungeon or two, and wilderness areas). Several funnel adventures to allow PCs to be readied for the game. A large, known, complex for the ease of play. If you have nothing better to do, you can always attempt to raid the Dark Paths. Simply exploring Ruined Toronto is hazardous...but rewarding. Points of familiarity for those familiar with the Greater Toronto Area. Hiring Board...You can take a job, go exploring, or set your own agenda. Players may have multiple active PCs. On any given game night (outside the funnel), each player may choose one of his or her active PCs, if that PC is available (i.e., the PC is not off on another quest, recuperating, a prisoner, etc). Disruptive players can be banned, but let's hope that never happens. In character Player vs. Player action is fine; out of character PVP is not. Any DCC material you might have will come in handy, but it isn't really needed. No published materials will be used without serious modifications, so you can own every DCC adventure available if you like. It makes no difference to me. Toronto Crawl Classics is obviously influenced by the wonderful work of the DCC community....in particular, Crawling Under a Broken Moon and Crawljammer. Buy all the issues if you want. Read them. They may help you. They may not. At least they will be entertaining. I am shooting for January 2016, although the best laid plans of mice and men often go astray. I am trying to find a public venue, preferably not too far from the Annex, to run public games in. Any help here would be great! Walkabout Thing: Init +3; Atk bite +2 melee (1d5 plus enervation); AC 12; HD 2d8+2; MV 30’ or climb 20’ or swim 30’; Act 1d20; SP enervation (1d3 Strength damage, Fort DC 15 or 1 point is permanent), regeneration by enervation, stealthy; SV Fort +2, Ref +3, Will +3; AL C.
John shook, and I passed him my pint. I wasn’t sure I believed him till then. Strange things happen in the Outback, sure. Uncanny, more than like. 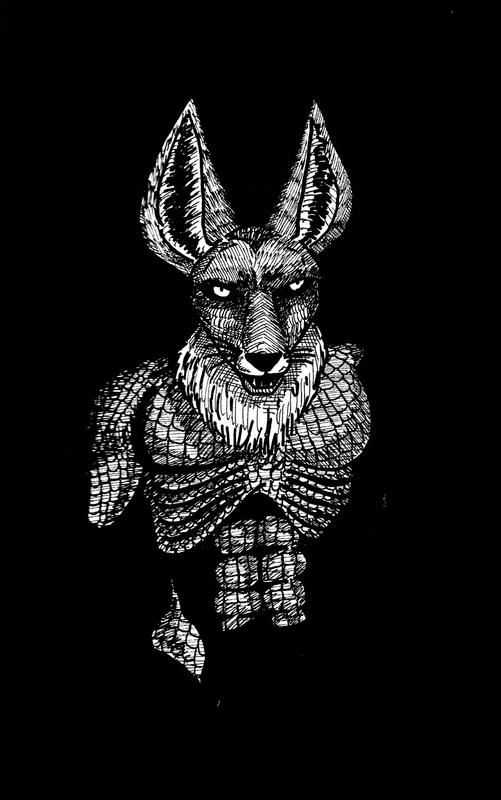 I’d heard stories of ‘roos that chased men and ate flesh, come up from the Dreamtime. I’d heard of drop bears, then koala-like critters that waited in trees till some bloke walked under, thinking it was just one of them slow-moving eucalyptus feeders up there. Nothing to worry about, right? But they say the drop bear, he eats meat. I’ve never seen any of them things. Australia’s got enough critters that can kill you without making up more. But when John cupped the beer with his hands, looked down at it, I felt a shiver down my spine. Because I knew – I knew – that this thing was real. More real to John than the untouched beer in front of him. The Walkabout Thing looks like a massive koala with dog-like jaws and a sinister attitude. When it bites, the victim takes 1d3 Strength damage and must succeed in a DC 15 Fort save or 1 point is permanent. It regenerates lost hit points equal to 1 per point of temporary Strength damage, and 5 per point of permanent Strength damage. Despite being nearly as large as a man, the Walkabout Thing is a cunning predator, gaining a +5 bonus to any stealth check. The physical product is a 480-page hardcover book. The cover and endsheets are color; the interior is B/W. The book is filled to the brim with art, in the classic TSR old-school style. The default binding is Smythe-sewn (“textbook” binding, very durable), although stretch goals may change that (see Kickstarter page). This, of course, left me open to merging two of my favourite things: Doctor Who and Dungeon Crawl Classics. 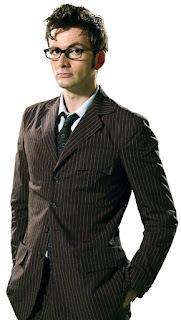 By the time of The Chase, the Daleks have developed a form of time travel analogous to the Doctor’s own TARDIS – a time machine that can track other time machines, and is larger on the inside than on the outside. Not only can it track the TARDIS, but it gains on the Doctor and his companions ever so slightly throughout the story. As we will see, Daleks in later-era stories do not always achieve this level of time travelling sophistication. In some ways, The Chase is a “sequel” (and “prequel”) to the Tom Baker-era story, Genesis of the Daleks. 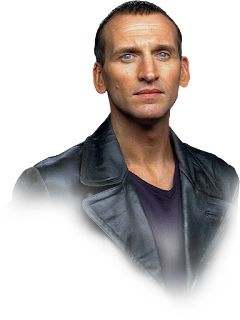 Obviously, Genesis of the Daleks didn’t exist yet in the program, but if we look from the outside, in Genesis the Doctor is sent back in time to the point where the Daleks are created in order to destroy them. In The Chase, the Daleks move back in time to stop the Doctor in his first incarnation. One might almost be considered a response to the other. In fact, this may be the first story where the Time War is foreshadowed. From the perspective of the Daleks, it may take place during the Time War. The Daleks in this story are no longer dependent upon radiation (as were the ones in The Daleks) and have their own internal power supplies (a departure from The Dalek Invasion of the Earth). Their understanding of humanoids has also improved, allowing them to create a near-perfect duplicate of the Doctor. It is also worth noting that, while no Dalek is seen levitating up stairs on-screen, the action in The Chase implies that these Daleks are capable of doing so. It is easiest to see this in the Marie Celeste sequence, where Daleks are able to reach areas of the ship only accessible by stairs. These are still not the Daleks of the new series, however, and they lack several refinements later Daleks will use. If they are part of the Time War, as seems likely, they are part of a group which has significantly less technology available to it than several later Dalek groups. 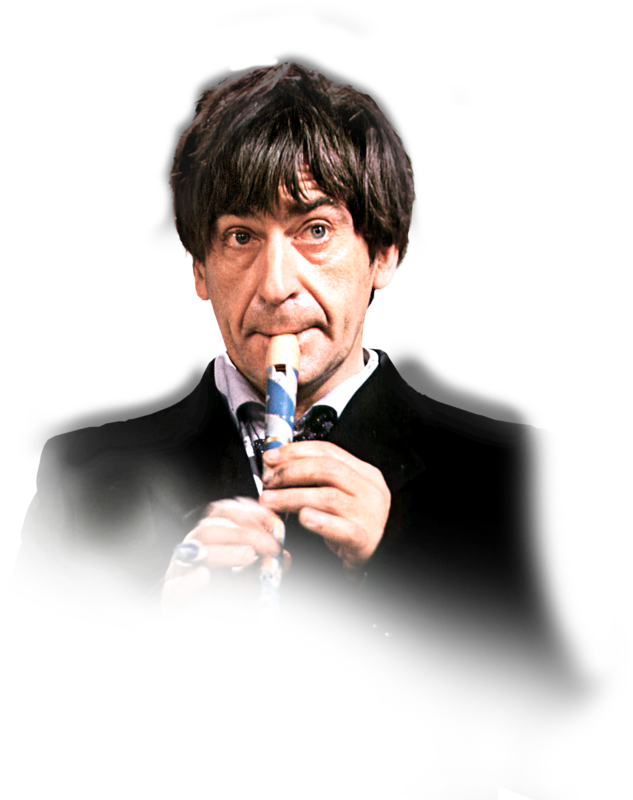 This may be due to changes in the timeline, splintering Dalek factions, or a simple lack of available resources. A lack of resources might place The Chase as post- Day of the Doctor from the Dalek’s perspective, or it might indicate that the Daleks have allocated greater resources elsewhere…such as an all-out attack on Gallifrey itself. Daleks have been a mainstay of the Doctor Who universe. 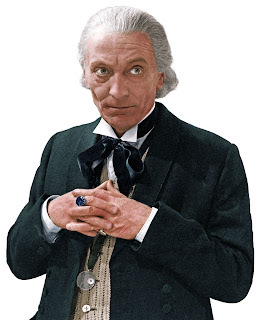 They appeared in the second televised story, and have appeared more times than any other villain. Indeed, the Daleks are the only creatures that appear in at least one televised story for every Doctor. They are a perfect villain species to appear in your Dungeon Crawl Classics game. They are even better suited to Mutant Crawl Classics, Crawling Under a Broken Moon, or Crawljammer games. Chase-era Dalek: Init +0; Atk plunger arm +2 melee (1d3) or energy weapon +3 ranged (1d6+3); AC 17; HD 1d12; MV 30’ or levitate 5’; Act 1d20; SP long-range communications, specialty arms, levitation; SV Fort +12, Ref +0, Will +7; AL L.
The Daleks in The Chase do not seem to rely on long-range communications as frequently as the Daleks in the previous two stories, although they still retain the ability. They are capable of replacing the plunger arm with specialty arms, such as a long range motion detector. (Earlier Daleks could replace the plunger arm with a high-powered acetylene torch, so this is not a new development.) These Daleks can slowly levitate up stairs, or along a plane not greater than 45º angle. Dalek Duplicate: Statistics as original; AL L.
Aridian: Init –2; Atk club +0 melee (1d4); AC 9; HD 1d3; MV 30’; Act 1d20; SP low-light vision; SV Fort +0, Ref +1, Will +0; AL N.
A species of rather ineffective piscine humanoids encountered on the planet Aridius in The Chase, the Aridians lived in the underground remnants of their ancient cities. Over many generations, the oceans of the planet had slowly dried, leaving the Aridians and the Mire Beasts to contest for what remained of the desert world. Not particularly brave, the Aridians attempted to keep the Mire Beasts out by building walls around them. 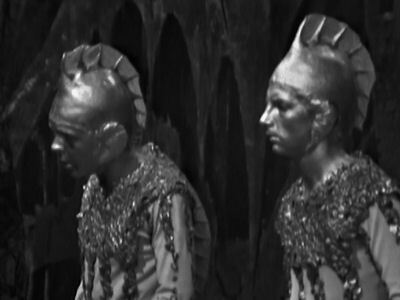 The Aridians also tried to sell out the Doctor and his companions to the Daleks, only to be foiled when the time travellers refused to cooperate. The Aridians would make a great creature for an adventure where you end up liking the people you have to oppose. They mean well, but they are easily frightened into bad choices. Mire Beast: Init –4; Atk tentacle +3 melee (1d3) or bite -2 melee (1d5+1); AC 13; HD 4d6; MV 20’; Act 2d20; SP infravision 60’, stealthy, grab, constrict or bite, hardy; SV Fort +4, Ref +1, Will +3; AL C.
This is an octopus-like creature, adapted to survival in dark caves and tunnels. 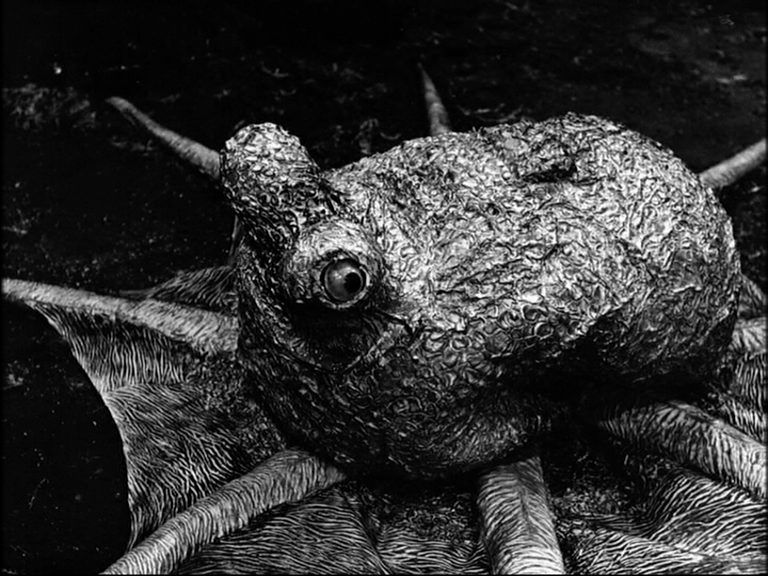 Mire Beasts are encountered on the surface of Aridius as well, although they are usually active only from twilight to dawn. During the day, they hide by burying themselves in the sand. They are somewhat stealthy, having a 1 in 6 chance to surprise in addition to whatever chance of surprise the judge typically uses. If a Mire Beast tentacle hits, it grabs the target. The victim can make an opposed Strength check (vs. +4) to break free, cause 5 hp damage (which does not count against the creature’s total), or succeed on a Mighty Deed of 4+. 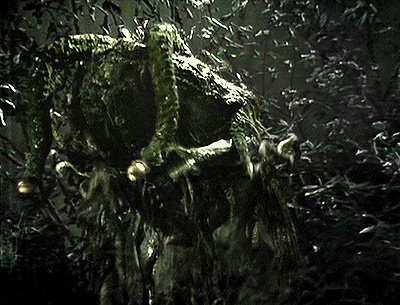 A Mire Beast who grabs a target can either do automatic tentacle damage or make a free bite attack in the next round with a +6 bonus. Mire Beasts are extremely hardy – even if reduced to 0 hp, they gain a DC 10 Fort save in 1d6 minutes to determine if they were slain or merely stunned. If the save succeeds, the Mire Beast is alive with 2d6 hp recovered. Mire Beasts possess a cunning intelligence, and are capable of concerted plans and action. Fungoid: Init +0; Atk grab +0 melee (0); AC 12; HD 2d6; MV 10’; Act 1d20; SP constrict and suffocate, sense prey, immune to mind-affecting; SV Fort +2, Ref +0, Will +0; AL N.
These are tall, fungus-like beings encountered on the planet Mechanus. They make a distinctive “popping” sound, which may be a form of communication among themselves. If they are able to grab a creature with their “umbrella”, they can do 1d3 points of damage each round thereafter due to constriction and suffocation. Although the fungoids do not see in the same way animals do, they are capable of sensing potential prey within 60’ by a combination of sensing heat, motion, vibrations, and sound. They are completely immune to effects that target the mind. Mechanoid: Init +1; Atk restraining arm +0 melee (restraint) or flame thrower; AC 18; HD 3d8; MV 20’; Act 1d20; SP restraint, flame thrower; SV Fort +10, Ref +1, Will +5; AL L.
Mechanoids are robots created for the colonization of other worlds. The 1st Doctor and his companions encountered them on Mechanus. They are roughly spherical, with triangular plating. 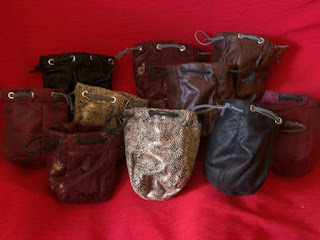 Each has two arms that fold into the Mechanoid. These can be used for skills, or can restrain an opponent they hit (opposed Strength to break free, the Mechanoid gaining +4 per arm restraining a creature, and multiple Mechanoids can restrain the same creature). Each Mechanoid also has a built-in flame thrower, which can strike multiple targets in a 20’ cone with a 5’ base. Each target in the area takes 1d6 damage (Fort DC 15 for half) and must succeed on a DC 10 Reflex save or catch fire (1d6 damage each round until a save is successful). Three Nights in Portsmouth is now available. Anyone that has explored the seaside town of Portsmouth knows that it is a town filled with secrets. FT 2 - The Portsmouth Mermaid only scratched the surface of some of these secrets. 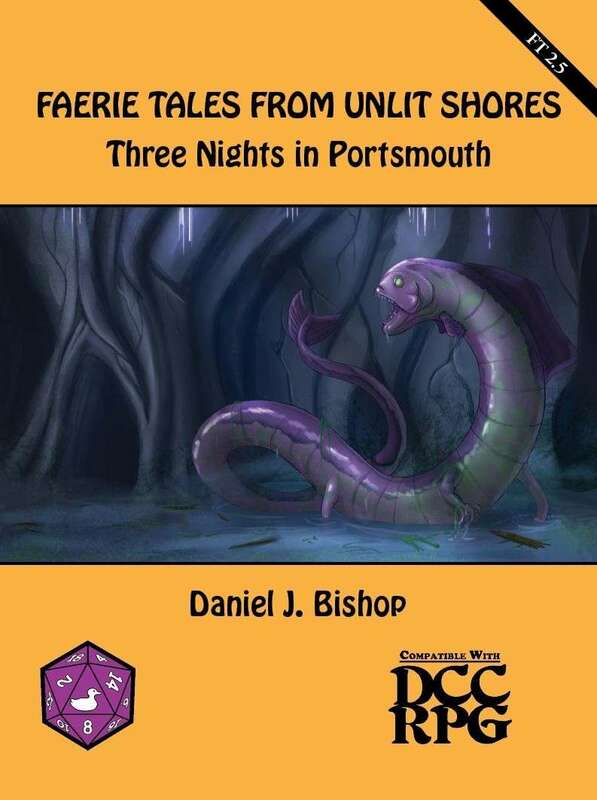 A Dungeon Crawl Classics anthology for 4-8 level 2 characters by Daniel J. Bishop. Original Dalek: Init +0; Atk plunger arm +2 melee (1d3) or energy weapon +3 ranged (1d6+3 or paralysis); AC 17; HD 1d12; MV 30’; Act 1d20; SP paralysis, long-range communication, reliance on radiation, reliance on static; SV Fort +12, Ref +0, Will +7; AL L.
Original Daleks are able to partially paralyze those struck by their energy weapons (2d3 Agility damage, recovered at a rate of 1 point per hour, movement speed reduced by 5’ per 2 points remaining). A second paralysis blast while this temporary damage is in effect requires a DC 20 Fort save, or the new damage is permanent. Original Daleks are reliant on radiation, taking 1d4 damage each turn their environment has insufficient radiation content. 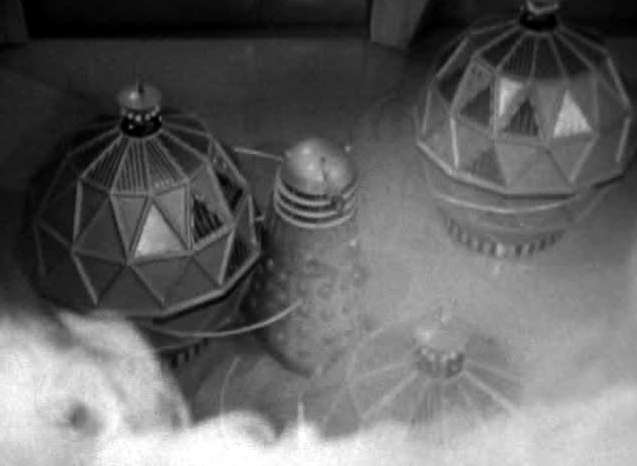 Their travel cases are powered through static electricity conducted through the floor of the Dalek city. If this connection is broken, the Dalek is helpless. Original Daleks cannot climb stairs. Original Dalek Creature: Init –4; Atk claw +0 melee (1d3); AC 7; HD 1d3; MV 5’; Act 1d12; SP reliance on radiation; SV Fort +0, Ref +0, Will +5; AL C.
The original Dalek creature, bereft of its cybernetic casing, is fairly defenseless. It has the same reliance on radiation that the original Daleks do. The difference in alignment between a Dalek in its casing and outside is based upon later lore. 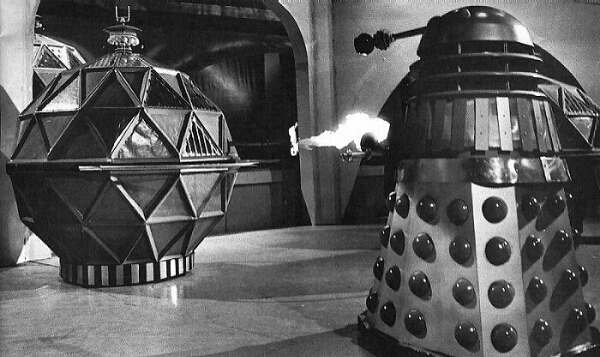 Daleks are quivering lumps of hate, but the Dalek casing actually programs much of the creature’s behaviour. As we will eventually see, uncased Daleks don’t like their cased brethren very much. Original Thal: Init +2; Atk by weapon +0 melee or ranged (by weapon); AC 10; HD 1d4; MV 30’; Act 1d20; SV Fort +0, Ref +0, Will +0; AL L.
The original Thals were agrarian pacifists, who hoped to come to terms with the Daleks. Their attempt to bypass the Lake of Mutations on Skaro, and then find a way into the Dalek city through caves in the mountains, would make a great DCC funnel adventure. Invasion Dalek: Init +1; Atk plunger arm +2 melee (1d3) or energy weapon +4 ranged (1d6+3); AC 17; HD 1d12; MV 30’; Act 1d20; SP long-range communication, reliance on broadcast power; SV Fort +12, Ref +0, Will +7; AL L.
Black Dalek: Init +3; Atk plunger arm +3 melee (1d4) or energy weapon +6 ranged (1d7+4); AC 19; HD 4d12; MV 30’; Act 1d20; SP long-range communication, reliance on broadcast power; SV Fort +14, Ref +0, Will +9; AL L.
By the time the Daleks invaded the Earth, they had overcome their reliance on radiation and static electricity. 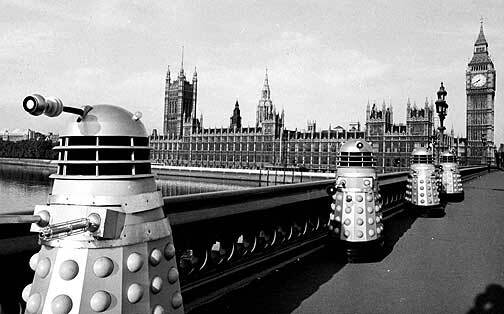 These Daleks each had a receiver dish with which they could obtain broadcast power from several Dalek compounds or saucer ships. They no longer sought to paralyze enemies – enemies were to be exterminated. In the serial, Earth’s magnetic core draws the Daleks to it, destroying them. A similar device could be used in a DCC or MCC Dalek adventure. Travelling across invaded Britain was a big part of the Doctor Who story, and could be used as a funnel adventure. Exploring a crashed Dalek saucer might also make for interesting game play…especially if some of the occupants are still active! A Dalek can be disabled if its receiver disc is damaged (Mighty Deed 4+), but these Daleks are far more efficient in their long-range communications, and instantly know that the Dalek unit is disabled. Slyther: Init +4; Atk claw +3 melee (1d3); AC 12; HD 4d6; hp 14; MV 40’; Act 4d20; SP enhanced senses, stealthy, fear attack; SV Fort +4, Ref +1, Will +3; AL C.
The Slyther was a “pet” of the Black Dalek, unleashed to control the human worker population, and allowed to eat anyone it could catch. It is likely that the Slyther is a Dalek mutant of some sort, larger than a man, and able to attack with multiple claws. It has enhanced sense, able to sense living beings within 100’ without needing to see them. It has a 1 in 3 chance of attacking by surprise, in addition to whatever normal chance the judge uses for other creatures. Finally, it induces fear in its prey – a creature targeted by the Slyther on its first round must succeed in a DC 10 Will save or lose its next action due to sheer terror. Roboman: Init -2; Atk by weapon +0 melee (by weapon); AC 8; HD 2d6; MV 20’; Act 1d16; SP long-range communication, insanity; SV Fort +3, Ref –2, Will +0; AL L.
Robomen are normal humans, operated on and controlled by the Daleks. 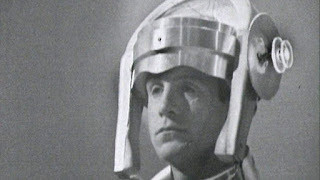 They are controlled by a headset reminiscent of the head cowling of a Cyberman; if this is damaged (Mighty Deed 3+), the Roboman is no longer controlled by the Daleks. The Daleks always know when a Roboman asset is lost, and usually investigate. 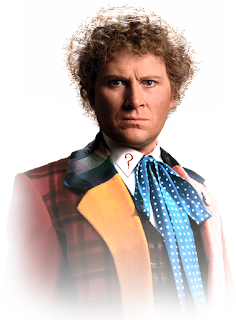 If the Daleks lose control of a Roboman, or on a 1 in 7 chance each time a Roboman is hit, it will go insane, seeking to destroy itself. Under normal circumstances, nothing can restore the humanity of a Roboman. 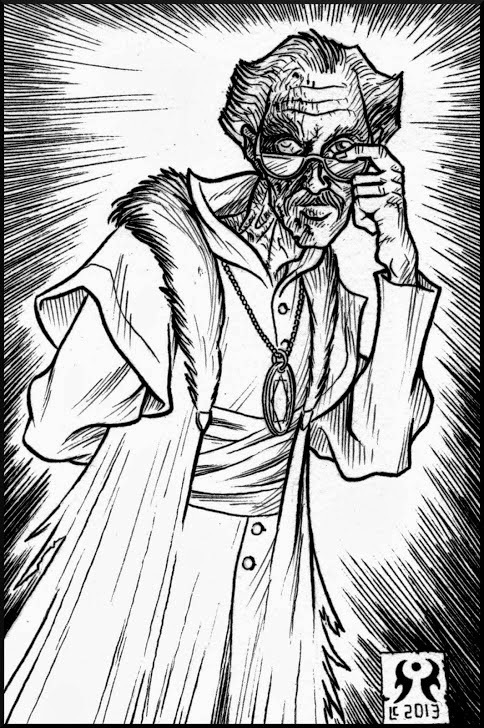 With the strange powers available to Clerics, Wizards, and Mutants, the judge may allow a Roboman to remember who he once was. To this end, it is worth noting that the Daleks tend to choose only intelligent specimens for Robotization. If these versions of the Daleks seem surprisingly easy to defeat, the author recommends that the reader view the original programs and makes any adjustments he or she sees fit to make. 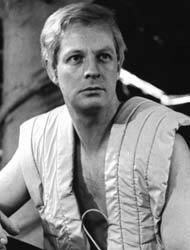 There are several stories, including the original (The Daleks), in which the Daleks are defeated by primitive weapons. 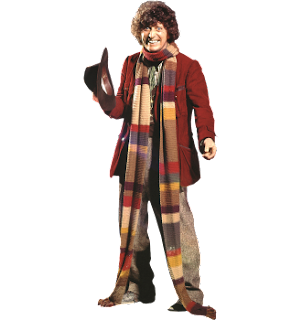 In addition, there were, at various times during the proceedings, twelve surprising guests – each one an incarnation of the Doctor. At some point during the Conference, the signed Peace Treaty disappeared. It is feared that one of the delegates is an agent of the Daleks. The Doctors have given testimony in message cubes. You can look at one message cube at a time. The delegates are also present for you to question, if you wish. Your mission is to find the Peace Treaty, and figure out who, if anyone, is working for the Daleks. As Adjudicator for Earth, I supported the Peace Treaty. It was my idea to include the Judoon and the Sontarans. Both are warlike races, but both would benefit from a secure alliance. The Judoon would gain policing authority over the border areas where Daleks have been attacking out colonies. The Sontarans would gain allies against the Daleks, which would allow them to focus on their millennia-old war against the Rutans. They would also get to fight the Daleks, and the Sontarans have never turned down being included in any military force. I don’t understand why Commander Storr acted the way he did. 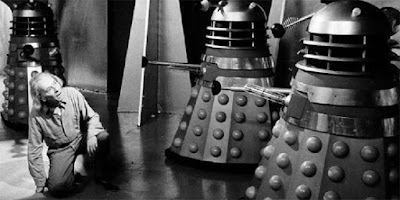 Before lunch, he wanted nothing to do with the Daleks. It was almost as though he were afraid of them, if that is possible. After lunch, he said he had only just arrived, and reversed his earlier position. Sontar almost declared war on the Alliance when we questioned his honesty. Then the Peace Treaty disappeared. I hope that we can find it. My people are peaceful, and do not like all this talk of war. I agree with the other delegates – we must defend ourselves against the Daleks – but I do not like it. It was very nice seeing the Doctor and Sarah Jane Smith again, though. 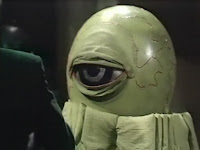 I met them on Peladon, a primitive world, but a staunch ally of the Galactic Federation. My people care a great deal about war and honour. Once, we were enemies of the Earth. Now, we are ready to stand with our allies. The Ice Warriors spend most of their lives in armour. We learn to recognize small differences. Commander Storr changed after lunch. 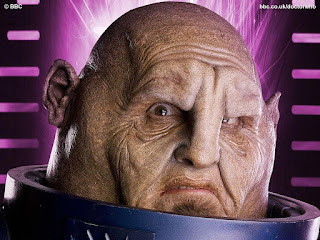 This was not the same Sontaran who argued so forcefully against alliance before lunch. I do not know how he changed. I do know that he changed. We have a great deal of respect for the Doctor. We were glad to see him attend this Conference in so many of his forms. 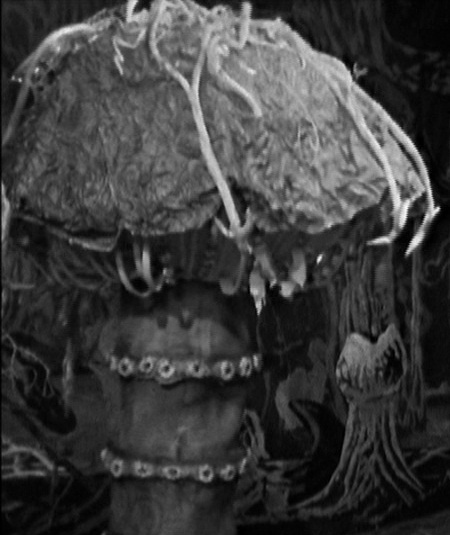 The Daleks have attempted to trick the Earth and Draconia in the past. The Doctor saved us from a grievous conflict that would have decimated both planets. They will not do so again. I am Commander Storr, of clone batch 3 million 4 hundred and 27. My arrival was delayed by a Rutan aggressor, which was dispatched by the 7th Sontaran Fleet 100 million kilometres away from our current position. When I arrived, the Doctor and others claimed that I had already been here, and that I had argued against an alliance. This is not true! This alliance against the Daleks makes good strategic sense, giving Sontar the opportunity to consolidate its forces against the hated Rutans and offering glorious combat against a superior foe. Sontar-Ha! The Judoon also claim that I was here. At first I suspected a Rutan trick – they can take the shape of other beings – but a DNA scan confirmed my identity when I came aboard…two hours before my actual arrival! The station log cannot be falsified, yet I know that I was not here! My clone batch comprises 2 million individuals with the same DNA. I have contacted Sontaran High Command to ensure that all active members of the clone batch are accounted for. My people came from the Earth, and our roots there go deep. We came when the Earth called for allies. It is true that we do not love things made of metal, and we do not love war, but we remember where we came from. Besides, the Daleks are the enemies of everyone. I am here only as an observer. I represent the Sisters of Plenitude on New Earth, currently headquartered in New New New New New York. I must say that this Peace Conference has been unusual. Several strange people have come and gone, and there have been strange noises. Grinding, wheezing…I do not know how to describe them. Someone must be ill, for at least either different doctors have been present, some dressed quite bizarrely. Of course the Silurian Confederation stands with Earth. We are the original occupants of the Earth. Our species went into hibernation long ago. When we awoke, we found our world inhabited by the descendants of the small mammals that raided our fields. There was conflict, all too often, but now we have learned to live together in harmony. I am here as the Administrator of the Pond-Copper Institute. We take apart captured Dalek pieces to try to find weaknesses. They are cyborg creatures, part machine, and part living being. Much of their behaviour is programmed into them by their travel machine casings. Someday, we may even find a way to live in harmony with the Daleks. We just need to find a way to stop the machine part from programming them to hate everything that isn’t a Dalek. Lo go flo ro slo mow toe row. Blow mow flo go so hoe row mow. Doh so tro grow no. Bo joe hoe mow slow flow row grow plo lo moe lo so go. Navarinos are peaceful. We’re not fighters, but we love the Earth, especially the Classic Era Earth of the 50’s, the 60’s, and the 70’s. We are technologically oriented enough to provide means of defence against the Daleks. We do not create weapons. The Transformation Arch was installed for my use, so that I could take this form. You humanoids sometimes find my natural form…distressing. Someone has tampered with the Arch. It is now set to transform whoever passes through it into a much smaller form. Some kind of insect, I believe. “Hmmm? Yes? Oh, enough of this bother. Yes, I was at the Conference with Susan and her two teachers, Barbara and Chesterfield. Chesterton. Humph. Yes, you could say I saw the Peace Treaty? Is that what this is all about, hmmm? It was all rolled up and wrinkled. A dreadful sight. Did you know those papers even had a dead fly stuck to them? No, I didn’t keep them. I gave them to a young man in a rather tasteless jumper. The whole thing had nothing to do with me. I was still trying to get those two young people home to Earth, and didn’t mean to be there at all. All active members of clone batch 3,000,427 accounted for. Inactive members include 454,302 who have died in battle for the greater glory of the Sontaran Empire. Sontar-Ha! Remaining inactive member of clone batch 3,000,427 is Former Battle Leader Svarr, court martialled for cowardice: Refusal to fight against Daleks in the Battle of Exxilon 5. Strategic calculations indicate high probability of Traitor Svarr operative in area of Station Zed Alpha. Imperative that Traitor Svarr be located and apprehended.